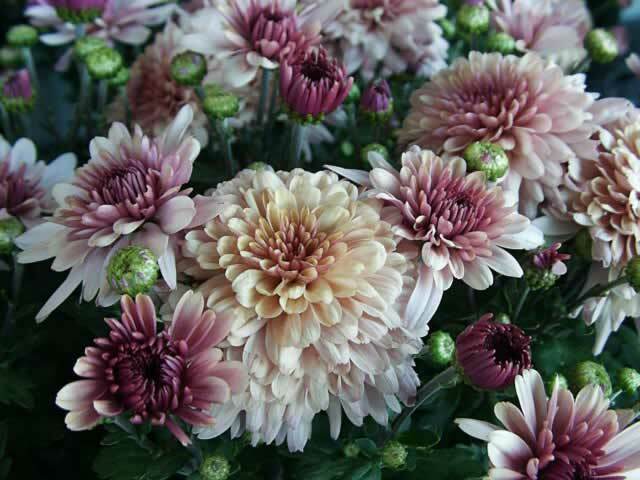 There are hundreds of varieties of Chrysanthemums, giving you a multitude of options for height, color, flower size and time of bloom. You can pick and choose to fit your wants and needs when you visit the nursery. In northern climates it is wise to purchase the earlier bloomers. Mums can be started as seeds, from cuttings and dividing, or can be purchased at a nursery in sizes from bedding plants up to gallon size and larger plants. They should be planted into well prepared, fertile, sandy soil. Mums resent 'wet feet' so the hole should be dug extra deep. I recommend that you not grow your mums in the same spot for more than three consecutive years to help prevent associated disease and pest problems. The plants should be spaced 18-30 inches apart for best results. Feed lightly every 2 weeks with a good balanced all purpose fertilizer. When the plants are 6 inches tall, pinch about 3/4 of an inch from each branch to promote more blooms and bushier plants. When they reach a foot tall, pinch them again. On the largest flowering types it is best to remove all buds except for the one on top. 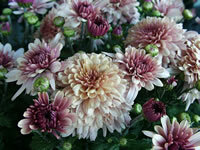 Chrysanthemums should be divided every three to five years to avoid overcrowding and promote maximum flowering. They should be divided in the spring when new growth appears. Dig entire clumps and separate the plants with a sharp, clean knife or spade. Remove all dead and diseased plant parts. Replant the divisions as soon as possible in a loose, well drained, rich organic soil. 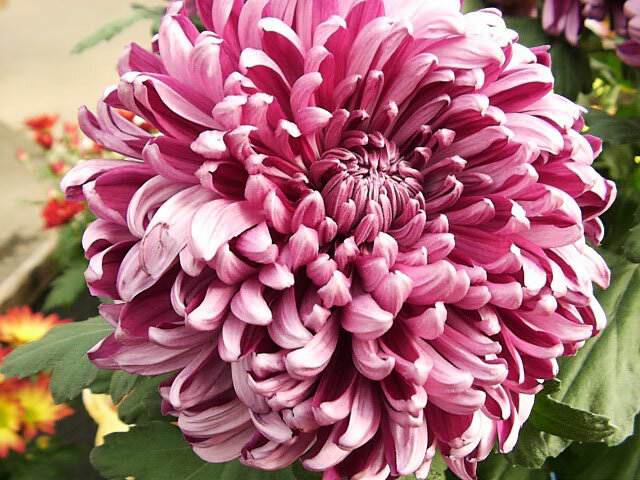 Chrysanthemums should periodically be moved to a new location, but if this is not feasible, the soil should be sterilized chemically to reduce danger of disease and insect problems. Remove the lower half of the leaves from a 4-6 inch healthy, fresh cutting using a sharp clean knife! Dip about 3/4 inch of the cut end into a rooting hormone such as Roottone® or Hormonex®. Insert the cutting about one inch deep into sterile moist sand, vermiculite or sphagnum moss. Create a mini-greenhouse over the container with poly film over a wire frame and place it in a bright spot (NOT full sun) until the roots form. Chrysanthemum seeds should be sown into the prepared soil where they are to bloom at least 2 months prior to the first frost. Seeds may also be started indoors in very early spring for later transplanting into the garden. After your plants have been killed back by hard frost, cut them back to the ground and provide a light airy mulch of evergreen branches or similar material. 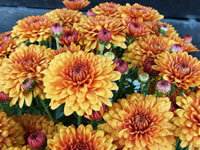 The most dangerous hazards for Chrysanthemums in the winter are constant wetness or ice on the leaves. Frost heaving caused by alternate freezing and thawing of the soil can also a major problem. To help with these problems and keep the plants somewhat protected and dry, you can mound the soil up around each plant, as well as creating a simple drainage ditch alongside. To help avoid the heaving try to keep the plants somewhat shaded and insulate their roots with a light airy mulch. You didn't mention what type of facilities you have for storage, so I'll go for the best case scenario. Once the flowers fade, move the Mum plants to a cool but well-lighted location. Remove any foil or other covering from the pot at this time. Be sure to keep your plants watered, but don't over water them. When the potting soil dries to a depth of two to three inches, water them well so that water runs out the hole in the bottom of the pot. By keeping the plant in a cool, brightly lighted location, you can keep the plants alive until the worst of the winter is past and you can plant it outdoors. If there is no new growth, it can be planted while the freezing temperatures are expected at night. When frost danger has passed, give em a shot of a 'bloom' fertilizer, for the earliest flowers.